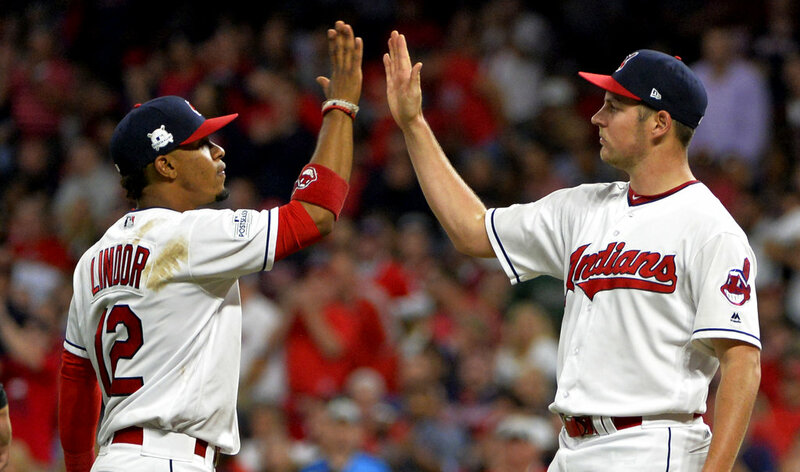 CLEVELAND (AP) — Trevor Bauer chopped slugger Aaron Judge and New York’s other big bats down to size, and Jay Bruce drove in three runs as the Cleveland Indians began chasing their first World Series title in 69 years with a 4-0 win over the Yankees on the Thursday night in the opener of the AL Division Series. Bauer struck out Judge three times, twice getting the MVP candidate looking. He allowed just two hits in 6 2-3 innings before manager Terry Francona turned to baseball’s best bullpen, using Andrew Miller and closer Cody Allen to finish the three-hitter. Allen came in with two on and two outs in the eighth to face, who struck out for the fourth time and angrily snatched at his bat frustration. Allen worked the ninth for a save. Bruce connected for a two-run homer in the fourth off Sonny Gray and added a sacrifice fly in the fifth as the Indians began a journey to try and end the majors’ longest Series title drought. Bauer was Francona’s surprise pick to start Game 1 over ace Corey Kluber, and the eccentric right-hander, perhaps best known for slicing a pinkie open while repairing a drone during last year’s postseason, delivered a performance that started October just right for the Indians. Kluber, an 18-game winner during the regular season, will start Game 2 on Friday against CC Sabathia. Coming off their win over Minnesota in the wild-card game Tuesday, when Judge homered in his playoff debut, the Yankees came in with momentum. Bauer stopped the Bronx Bombers in their tracks. He struck out eight and took a no-hitter into the sixth before Aaron Hicks doubled with one out. It was the longest no-hit bid by a Cleveland pitcher in the postseason, bettering Hall of Famers Bob Feller (1948) and Early Wynn (1954), who both went four innings. Taking the mound to his usual thundering warm-up music, “The Pursuit of Vikings,” an intimidating song by Swedish metal band Amon Amarth, Bauer didn’t mess around. He struck out Judge in the first watching a curveball before fanning Gary Sanchez with pitch way off the plate. Bauer struck out Judge again in the fourth, but the All-Star reached on a wild pitch. Bauer, though, regrouped by getting Sanchez to bounce into a double play before he freezing Didi Gregorius for his sixth strikeout. Bauer got help from All-Star-second baseman-turned-center fielder Jason Kipnis, who made a diving catch to rob Chase Headley in the third. As Kipnis slowly got to his feet, Bauer raised both arms above his head, pumped his fist and screamed to salute his teammate. Bruce gave the Indians a 3-0 lead in the fourth with a towering homer to right. After Edwin Encarnacion walked, Gray came inside with a 0-1 fastball and Bruce got around on it. As his shot cut through the fall night, Judge appeared as if he might be able to make a play near the wall, but the 6-foot-7 slugger could only watch as Bruce’s shot sailed into the seats. Bruce nearly caught Encarnacion on the bases, and as he finished a home-run trot that was more of a sprint, Cleveland’s fans hollered “Bruuuuuuuce” like a crowd at a Springsteen concert. The Indians are 43-9 since Bruce arrived in an Aug. 9 trade from the New York Mets. Because of his personality and unorthodox training techniques, it took Bauer some time to feel comfortable with his Cleveland teammates. But they’ve grown to appreciate both his quirky ways and the fact that he’s a gamer. Bauer said Wednesday that he was “miserable” and depressed earlier this season, when he was struggling and unable to help the Indians. He’s doing his part now. The plan to have their ace start Game 2 — and in Game 5, if necessary — has been in the works for weeks. Kluber, who pitched on short rest three times in last year’s postseason, doesn’t care when he gets the ball. For the second straight year, LeBron James and the Cavaliers came to the ballpark to root on the Indians, their downtown next-door neighbors. James wore a red, hooded sweat shirt and waved to the crowd when he was shown on the scoreboard. Tags: baseball, Cleveland, Games, garysanchez, Indians, New York Yankees, win. Bookmark the permalink.